This entry was posted on Wednesday, July 20th, 2011 at 8:15 pm	and is filed under Personal, Technology. You can follow any responses to this entry through the RSS 2.0 feed. You can leave a response, or trackback from your own site. Thx man, had the same problem today… Turned out I’v broken me USB just the way it is broken on your photo! Before finding your suggestion I’v tied resetting coms, unplugging everything but found no luck there! Very usefull tip, thx again! 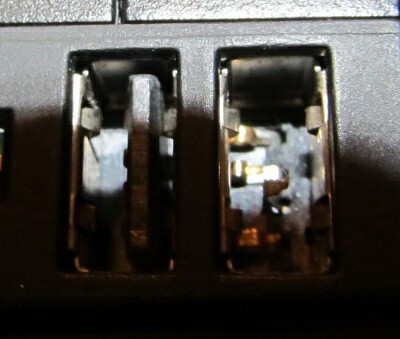 Had the exact same problem tonight and ran across this post… Realized my USB pins were also mangled. Was able to straighten them out and reboot. Thanks for the tip. Don’t think I would have figured this one out!